200+ Communications Drivers for Communicating Directly with PLCs, Drives, Motion Controllers, etc. The ProducTVity Station is a ready to deploy solution for displaying productivity information, andon messaging, and process status on any off-the-shelf TV, PC monitor and even projectors. The PTV leverages over 200 communications drivers via three independent serial ports and an Ethernet port, to connect and collect data from virtually any PLC, drive, bar code scanner, etc. Its 720p (1280 x 780 resolution) DVI output is compatible with both 720p and 1080p/i TVs. The ProducTVity Station’s built-in data-logger can record any key performance indicators, as well as andon events for later review. The PTV can synchronize the log files with any FTP server and/or Microsoft’s SQL Server for further analysis. The ProducTVity Station extends production monitoring to remote personnel by providing email and text alerts, and its built-in webserver allows productivity information to be monitored via any networked PC or smart-phone. If enabled, remote personnel can take partial or full control of the system remotely, allowing a maintenance person to effect changes without a site visit. The ProducTVity Station ships complete with a 2GB CompactFlash card, as well as a DVI to HDMI cable 4.6 m (15'), and HDMI/DVI adaptor. The PTV is programmed with the popular Crimson® software. This software is known for it easy-of-use drop & drag data mapping and extensive graphic library. To view the specification, please click on the "SPECS" link above. 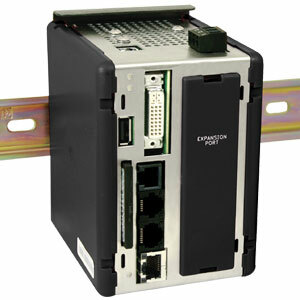 For additional information and our full product offering of the I/O Modules, please view the Related Products below. Note: Comes complete with 2 G memory card, 10 foot long DVI to HDMI cable and HDMI to DVI adapter.